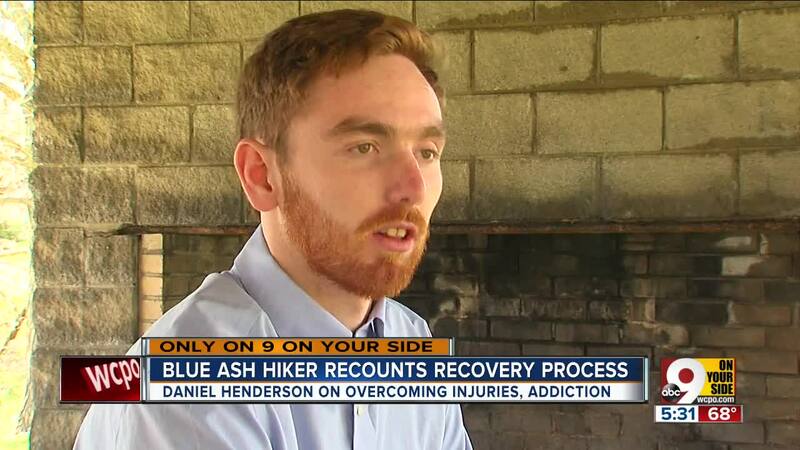 BLUE ASH, Ohio — When a rescue helicopter lifted Daniel Henderson’s broken body out of a Utah canyon, his survival was far from certain. Henderson’s lungs had collapsed, and he was covered in blood. All the bones in his face were broken, along with nearly every bone on the left side of his body from the waist up. He had a heart attack, then had a stroke and was in a medically induced coma for three weeks. When Henderson finally woke up, he had to deal with the aftermath of a traumatic brain injury. Daniel Henderson during his recovery in a Utah hospital. As difficult as all that was, though, Henderson said his recovery from falling 200 feet was nothing compared with what he had already been through. Now Henderson is sharing his story of recovery and launching a business to help others who are struggling, whether that struggle is with addiction, mental illness or a traumatic brain injury. Her son, Doug Strotman, hurt his head the day after Thanksgiving and has been in the hospital since. Strotman has made progress, Thomas said, but his short-term memory is shot and he still has a long way to go. Thomas met Henderson after leaving an online comment about another person who had been injured. Now she goes to church with him and his mom each week and counts on the daily inspirational messages Henderson sends her. Doug Strotman, left, with his son, Bryson. Others might call him a walking miracle. Wes Dietlein was with Henderson the day he fell. The two men had met in Salt Lake City, Utah, at Alcoholics Anonymous meetings there. Dietlein was in Utah to get treatment for his alcoholism. Henderson had been sober for a few years and had a job at a treatment center called Wasatch Crest. Dietlein was struggling with painful cluster headaches and was starting to become depressed, he said. To cheer him up, Henderson suggested they go for a hike. They hiked up Little Cottonwood Canyon near Lisa Falls, passing a series of waterfalls to reach a tree at the top of the ridge. They stopped and then looked for an easier way down, Dietlein said, because they worried the same path would be too slippery. Daniel Henderson, left, and Wes Dietlein in a photo taken before Henderson fell during a hike on March 30, 2018. The two friends were “bushwhacking” their way down the canyon, he said, but nothing felt extreme or dangerous. Then Henderson vanished from view. Dietlein rushed to the spot where the rocks slid away. When he finally saw where Henderson had landed, Dietlein said he feared the worst and immediately called 911. “He was face down, and I remember telling the 911 dispatcher, ‘I think he might be dead,’” Dietlein said. By the time Dietlein made his way to his friend, Henderson had rolled over. He was alive, but Dietlein could hear a gurgling sound coming from his lungs. “People who fall like that don’t live,” said Wendy Stine, director of business development at Wasatch Crest. The facility thought of Henderson as family, she said. The staff prayed for him, made him meals and visited him in the hospital, she said. After he got better, Wasatch Crest invited him to share his story with clients there. Daniel Henderson during a hike on March 30, 2018, before he fell and nearly died. Henderson started drinking as a teenager, he said, as a way to cope with his anxiety and depression. Until the drinking made his problems worse. Henderson spent time in jail and psychiatric hospitals. He tried a number of different treatment centers and was homeless for about four months, he said, often sleeping under a bridge in Covington. “I had the option to accept help, but I couldn’t picture life without alcohol and drugs,” he said. Henderson’s parents had an intervention with him when he was 18. They sent him to a treatment center in California where he received clinical care and learned how to enjoy life without drinking or smoking weed. Before long, Henderson started working in the recovery industry, embracing the ability to help other people with addictions. “In recovery, we have to work really hard to find gratitude and be of service to others, and he has embodied that and he embraces our mission of living each day grateful,” Stine said. Henderson has started his own business called Recover Wisely, which offers substance abuse treatment consulting and recovery coaching. The goal is to help people with addictions find the treatment facilities that will work best for them and to help people through the process, he said. Daniel Henderson during active addiction. He also speaks to groups about his dual recoveries — from addiction and from his fall — even as he continues to receive treatment from the Lindner Center of HOPE for his mental health problems and to continue to heal his brain. Chris Tuell, the clinical director of addiction services at the Lindner Center and an assistant professor of psychiatry and behavioral neuroscience at the University of Cincinnati, asked Henderson to speak to his chemical dependency class. In May, Henderson will fly to Kansas City, Missouri, to tell his story to Angela Pugh for her Addiction Unlimited podcast. “I’m very much about the empowerment of being an addicted person and living a life of recovery," Pugh said. "I like to share those stories of victory." Henderson contacted Pugh to ask about being on the podcast, and she jumped at the chance after learning his story, she said. At only 22 years old, a little more than four years sober, and barely a year removed from the fall that nearly ended him, Henderson has done more surviving than most. Daniel Henderson speaking at a class at the University of Cincinnati. Stine said she couldn’t wait to see what’s next for him. “That’s what’s so exciting about recovery,” she said. “Once you’re in, you’re just never sure where it’s going to end. More information about Recover Wisely is available on the company’s Facebook and Instagram pages. Henderson also is trying to help Tracy Thomas raise money for her son’s financial obligations. They have a GoFundMe campaign that is still raising funds.